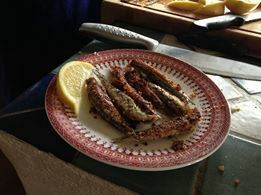 A plate of anchovies I cooked on my visit to Granada, Espagna. The fishmonger taught us how to gut and behead the anchovies with one quick flick of a finger. Published: October 30, 2013 Dimensions: 261 × 195 Posted in: My generation doesn’t eat supper Post a comment or leave a trackback: Trackback URL.